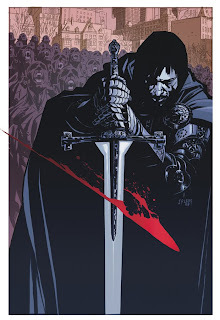 Top Cow Productions, Inc. announced it will publish the first, complete story arc of William Harms’ Impaler in a new trade paperback that will debut this October, and then will launch a new series for the property in December. The first three issues of the series were initially published by Top Cow parent company Image Comics in 2006-2007, but was never completed. The Impaler Vol. 1 trade paperback collects those three issues plus the final, three never-before-seen issues of the initial story arc. Top Cow was so excited by this series that it also greenlighted a new ongoing to follow the collection. In Impaler, a derelict cargo ship is found adrift offshore during a terrible blizzard in New York City. When New York’s Finest is sent to investigate the missing crew, an unspeakable horror is unleashed that quickly spreads all over the snow-covered borough, as a vampire plague quickly moves through the city’s population. The people’s only hope lies in Vlad Tepes, the real-life historical inspiration for the vampire legend, Dracula. Vlad the Impaler arrives to defend the city from the ever-growing vampire horde, but how much can one man do against an army of thousands? Impaler Vol. 1 boasts a stunning cover by John Paul Leon (Earth X) and features artwork by Nick Marinkovich (Nightwolf), Nick Postic (Underworld) and Francis Tsai (Marvel Comics Presents). The introduction is written by noted science fiction and horror writer F. Paul Wilson, who is responsible for the popular Repairman Jack series of novels and such horror books as The Keep, Midnight Mass and The Touch. Extras in the collection include script pages from unused scenes and bonus artwork. In December, Top Cow will launch Impaler as an ongoing series, featuring art by British newcomer Matt Timson (Popgun). Impaler was nominated for an International Horror Guild award and received accolades from Ain’t It Cool News, Rue Morgue magazine, Cinescape and Metro (Toronto).